Have I ever told you all how much I adore Make Up For Ever? No?! I is just a little bit obsessed… Anywho, after several emails from all of you, and countless teasers from the Makeup Show LA (Felicia, I am looking at you! ), you know it wouldn’t be long before I gave in to the siren call of all the new goodies just launched by my precious. With the goal of doing some investigating (and purchasing, but don’t tell mom! ), I embarked upon an epic journey of great import to the famed land of cosmetic hopes and dreams known as the Make Up For Ever Boutique. Completely overwhelmed by the face candy explosion, and as excitable as a tot in a candy store, I set about the incredibly difficult (not really) task of playing with makeup. Blogging and playing with beauty products is hard work you see, and I was very fortunate in that I had the amazing KJ Bennett present to guide me through it all. 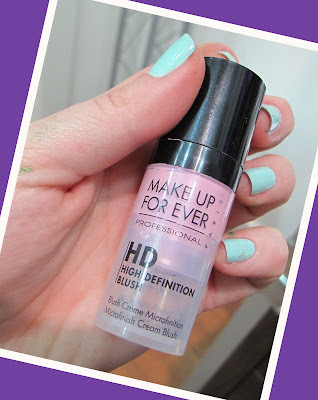 HD Blush is a creamy gel formulation packaged in a teeny tiny squeeze pump. Similar to the HD foundation, the dry down is neither matte nor shimmery, but instead a glorious in between that blends into the cheeks like second skin. The product is ultra pigmented, and a little less than a pea sized drop has the ability to properly blush up both of your cheeks beautifully. Wear on these is phenomenal, and your flush will last all day. There are currently 14 shades available, running the complete range from the palest pink to the deepest berry. Since these are so blendable, I truly believe that each and every shade will look beautiful on everyone. To give you an idea of the size of a tube, here it is in my hands. Though it is teeny tiny, keep in mind that the miniscule amount you need to use ensures that this product will last a ridiculously long time. My only issue with the packaging is getting slightly less out of the pump for one use. A teensy amount does it, while the pump sometimes emits a teensy bit more than weensy. Swatched on paper, here are all of the shades. All except 12 actually, which was m.i.a. This is a fairly accurate depiction of the colors. Sorry for the lack of hand swatches for all, I was already marked up with aqua creams. And here I am wearing the shade I purchased, number 7. The new MAKE UP FOR EVER HD Microfinish Blushes are already available online on Sephora.com, and will be coming to Sephora stores sometime next month. You do not want to wait to check these out, because these blushes are too amazing to be missed. Stay tuned for more on MUFE, coming ridiculously soon. awww what a pretty picture of you, love it! These look great, I just wish MUFE was more widely available in the UK. Why i didn't get #3 & 5?? they are so pretty. 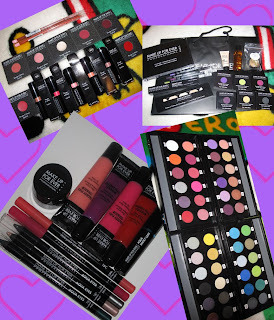 Makeupaddict, they are wonderful. Perhaps someone could cp for you? There is always a problem with pump products. I find it's always easier to just unscrew the top and dab it on your hand. These swatches are lovely and so helpful. I want them all.